Vehicles must display a current valid licence plate. No automobiles, trailers, or other vehicles shall be left at wharf approaches, launching ramps, driveways, or other prohibited areas. Vehicles so left may be towed away at the expense of the car owner. Trailers of any kind are not permitted to park on Marina lands on the north side of Harbour Road. Bikes, motorcycles, or similar powered vehicles may not be ridden on the docks. Wheelbarrows must be returned to the car parking lot after use. Ensure no leaks from oil containers or drips from wheelbarrows when transporting oil products. Smoking is not permitted in any building and discouraged on Marina property. Grassy areas are to remain free of pets. Pets must be kept on a leash at all times. In consideration of others, please pick up after your pet. In-water hull washing must not release anti-fouling paint. Boats are to be operated at a safe speed, not to exceed 4 knots and wake is not to affect other vessels or docks. Quiet time is 10pm to 7am. No signs shall be displayed on any boat, trailer or boathouse. Painting (anchor chain etc.) and staining of items or gear on docks is prohibited. Mixing of resins and epoxies on docks is prohibited. Do not fasten roller fenders or cleats to docks. Fenders and other chafing gear shall not be secured to docks but must be made fast to boats. All items or gear of any sort must be stored on boats. No dinghies, fenders, carpet, stairs, bikes, power cords, water hoses etc. can be stored on docks or storage space. Van Isle Marina reserves the right to remove any such items. After use, water hoses must be removed from taps. Long-term pressurizing use is not permitted. All tarps or boathouse curtains must be white or blue in colour and in good condition. Alterations to boathouses must have prior written approval of the Marina. Sewage holding tanks must be used within the Marina. No garbage, litter, wastes, bilge contents, petroleum products or other organic or inorganic wastes shall be emptied overboard or escape or be deposited anywhere within the Marina except into receptacles provided for such in the Marina. Only galley trash is to be placed in the refuse compactor. The Owner shall not store inflammable liquids, oily rags or other inflammable or volatile substances on the Marina. Unless the Owner is in attendance the Owner shall not permit any reflective type electric heater, flame type burner or oil burner to be operated in the boat or boathouse or on the Marina. Trades people must report to the Marina office before entering docks. Capture and contain all material from sanding, grinding or scraping. Boat stands will be positioned only by marina staff. Be aware of equipment, power cords, tripping hazards or overhanging obstacles. 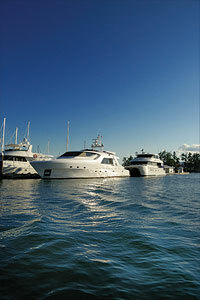 Be aware that Marina property can be slippery or icy depending on weather conditions. Be aware that you may be exposed to noxious fumes or materials. Wearing a Personal Floatation Device is recommended. Use of environmentally-friendly products is encouraged. Clean storage space daily and prior to launch. Sand blasting and spray painting are prohibited.